Picture this…a schmear of your own slow cooker apple butter on toast, plus a container stored in the freezer so you can serve it on top of Brie with toasted walnuts as a holiday appetizer! Maybe it was a Puritan’s sense of humor, or poor marketing on the Pilgrims’ part, but there isn’t any butter in apple butter; it’s really thick apple sauce made in the crock pot overnight with spices and honey. You can serve it on a pork chop, with morning pancakes, or fold it into loaf bread. Our recipe, adapted from one we like on Food.com is really easy. It’s the perfect make-ahead for Thanksgiving or any holiday brunch. Butter is a misnomer, here. This is really a thick warm-spiced sauce. Our region has so many wonderful pick-your-own apple farms. 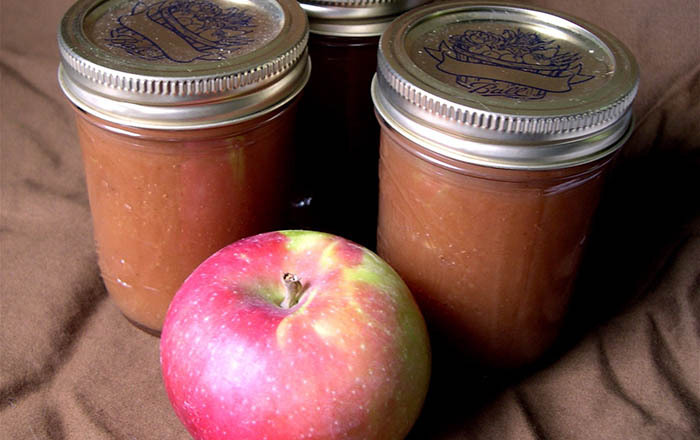 Grab some local honey while you're there to pick a bushel (or two) of apples. In a large bowl mix together the sugar, cinnamon, cloves and salt. Pour it over the diced apples, add the honey and mix well. In the morning, remove the crock pot lid and cook it in low for an hour, which thickens it. Once cool, the apple butter can be frozen and served later, defrosted. Making it this weekend!! ???? Let us know how it turns out. Thanks for listening! I was listening to NPR when I heard this recipe. Let me just say, I couldn’t wait to make it and it turned out fabulous! I use it on toast and even used it as a filling in a Pull-Apart bread recipe … Delicious! I love this recipe and look forward to making this a Fall tradition with my kids as they get old enough to help me pick the apples at our local orchard. Thank you! You are SO welcome. Glad you liked it. Also, thanks for listening; we appreciate it! I love apple butter. This seems like a lot of sugar. Possible to use less and more honey or agave? Only one way to find out. If you try it, report back. Thanks! Just heard last week’s podcast and, as usual, I want to try several recipes discussed. For this one, how can I convert the recipe for a conventional oven? I’m thinking of using a lidded cast iron dutch oven at 225 degrees overnight….sound do-able? 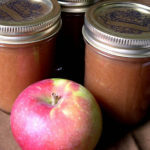 There are many, many overnight apple butter recipes on the web. . .all of them seem to use a slow cooker. We haven’t tried this recipe in the oven, so while it does sound do-able at the low temperature, we’re sticking with the ease and reliability of the slow cooker. My kids went crazy over this Apple Butter and wanted to eat it by the heaping spoonful 🙂 I covered it and cooked it on high for 1 hour and on low for 12 hours, uncovered it and cooked it on low for an additional 2 hours. Added bonus, our house smelled sensational for days!! It’s delicious! I will say that I use my food processor to grate the apples and I leave the skin on. It makes the prep go SO much faster and by the time you use the immersion blender it is perfect!